Sea level has risen at an average rate of 4.6 mm/year since 1948 at Rockport, Texas. The rate is increasing and models predict sea level will be from .46 to .87 meters higher along theTexas coast by the end of the century. That may not sound like much, but given the nature of the landscape, that rise will shift the coastline inland by an average of 1 to 2 kilometers and significantly affect bays, estuaries, marshes and current upland habitats. Conservation of species, like the endangered whooping crane and Aplomado falcon and several species of conservation concern such as reddish egrets, clapper rails and seaside sparrows, relies on the ability to identify and target areas that have potential to allow habitats and species to adapt as sea level rises. In response to the inevitable changes to coastal ecology, the Gulf Coast Prairie Landscape Conservation Cooperative (GCP LCC) initiated a project to apply a conservation design approach to the central Texas coast. 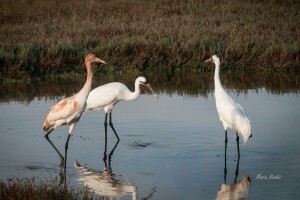 Whooping cranes on Texas coast where sea level rise may alter habitat conditions. Dr. Elizabeth Smith with the International Crane Foundation (ICF) and Dr. Felipe Chavez-Ramirez with the Coast Prairie Landscape Conservation Cooperative Gulf Coast Bird Observatory (GCBO) conducted the GCP LCC study. The project required a substantial technical effort, which was supported by Luz Lumb and James Gibeaut of the Harte Research Institute for Gulf of Mexico Studies at Texas A&M University – Corpus Christi. The U.S. Fish and Wildlife Service funded the research with additional support from the ICF, GCBO, Harte Institute and the Wildlife Management Institute. The study was conducted on the section of Texas coast between Houston and Brownsville, surrounding the Matagorda, San Antonio and Aransas Bays. This area was chosen because it includes the Aransas National Wildlife Refuge, which provides critical winter habitat for the only wild population of whooping cranes along with several other bird species of concern. The objectives of the project were to create a composite habitat dataset that identify the spatial extent of coastal habitat types, developed lands, and protected areas in the project area; estimate the amount and spatial configuration of habitat for whooping cranes; develop projections of the amount and spatial configuration of habitat and potential impacts on other selected bird species; construct maps of habitat shifts in coastal prairie and marshes under various sea-level rise scenarios; define the shifts in habitat availability and extent for the whooping crane and other selected species; and recommend ways to apply the methods used to extend results to additional areas within the Gulf Coast Prairies and Marshes Ecoregion. The conservation challenge posed by sea level rise is clear, based on the biology of whooping cranes. The 300 or so remaining whooping cranes establish winter territories in areas of coastal salt marsh characterized by plentiful food resources and low salinity levels. Cranes feed mainly on the blue crab and wolfberries that can be found in abundance in these coastal marshes during most years. Cranes spend the vast majority of their winter period in these territories and defend their territory against other cranes. The intermediate salinities in these marshes are favorable to blue crabs and important to whooping cranes because they can drink brackish water. If salinities rise above 15 – 20 ppm, the cranes must fly to upland water sources in ponds and wetlands outside their territories to drink. With sea level rise, water depth and salinity in areas currently used by whooping cranes will increase lowering food availability and habitat quality in these areas. Similarly, current upland habitats will experience changes induced by saltwater intrusion and higher storm surges. Given the degree of human infrastructure already established along this stretch of coast, rapid ongoing development, and the high probability that existing and future human structures will be reinforced in response to sea level rise, it cannot be assumed that habitat currently available and important for whooping cranes and other coastal species will simply march inland as the water rises. Conservation design, an element of Strategic Habitat Conservation, is a deliberative and quantitative approach to identifying those areas that have the highest potential to provide habitat in the future. The results of this study will be available soon on the GCP LCC website. 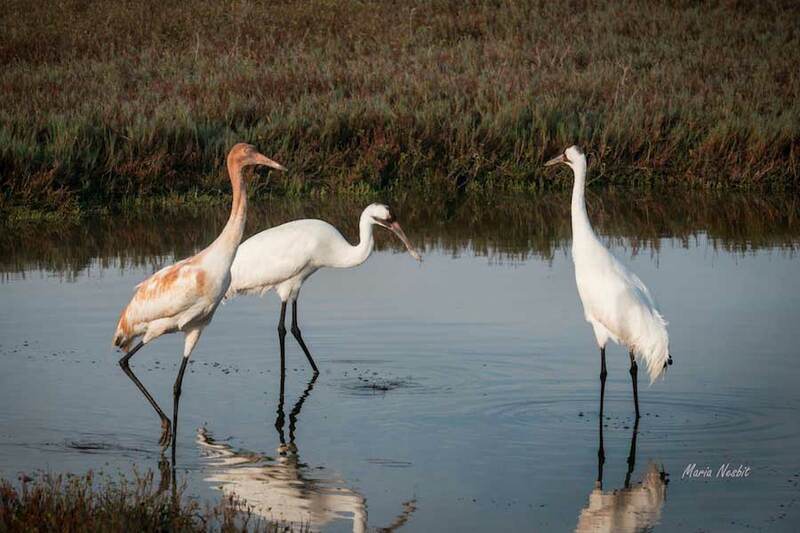 The final report includes extensive information on current habitat types as well as the distribution and biology of whooping cranes and other selected bird species. It provides maps of the current spatial distribution of habitat and projections of future habitat and bird use areas based on six different sea level rise scenarios. Results of this project will be used by LCC partners including the U.S. Fish and Wildlife Service to prioritize investments in habitat conservation for refuge expansion along the Texas Coast. The results will help to inform decisions on infrastructure investment by conservation organizations looking to conserve avian species in this area of important habitat, thus contributing to conservation objectives continentally for migratory species like the whooping crane. The Wildlife Management Institute (WMI), in partnership with the U.S. Fish and Wildlife Service (FWS) is providing support to the Landscape Conservation Cooperative (LCC) network. This section of the Outdoor News Bulletin provides readers with regular updates on LCC efforts involving WMI.